You are currently browsing the category archive for the ‘Ski touring’ category. As the speedometer crept over 110 kms, I realized that I could stay in the truck lane and content myself with driving blind behind a big box, or I could speed up. The other cars were simply whizzing by and there did not seem to be any speed limit. Go, little Panda, go! The fastest cars in the world come out of Italy, of course. They were built by and for Italians, for people who seem to believe that they have to keep up with Mario Andretti or they’ll be letting the home team down. It would not be a leisurely drive up to the mountains, but it would be quick. Aside from an inadvertent detour at the end of the motorway which almost took us into France, all went well. The mountain road from Aymavilles to Cogne required all my attention. Fortunately, there was no ice, little traffic, and plenty of places to pull over and let the locals pass. Our albergo was in the village of Lillaz. There was a large parking area outside the village, but I decided to be bold and follow the signs to the hotel. It was like driving through a toy town. 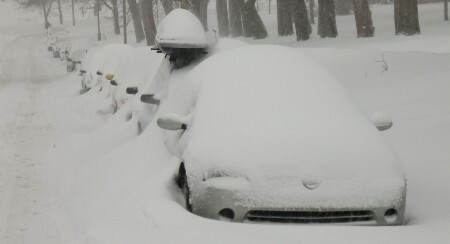 Enormous amounts of snow clung to the rooftops. The streets were barely big enough for a car. The last turn had my wife holding her breath. And then, there we were. Later, we discovered the reason the hotel had been booked solid until our lucky, last-minute cancellation. An annual cross-country race was scheduled to start the next morning. Over 750 competitors would be out on the trail. The fastest would be done in two hours, of course, but the slowest….? Our host had neglected to mention the race when he was on the phone with our travel agent, but he assured us we could be out skiing by 10:30. Lillaz is famous for its cascate (frozen waterfall), which is a short walk from the village. We made our way out there to get some exercise before dinner. We were starting to lose the light, but there was a small group of climbers at the base– mostly Brits. We were looking at the first of four “pitches.” If I understood correctly, this particular fall was actually 1500 meters high. The whole area is a mecca for ice climbers. It is an excruciatingly slow and scary sport to watch from the snow below. Occasionally, chunks of ice would get dislodged by an ice pick, come plummeting down, hard and dangerous as rocks. The next morning we got in a little bit of skiing before we were hustled off the tracks by locals, who must have thought we were mad. They were out in force to watch the three leaders fly by. Most of the participants were Italian, but the event had attracted some international skiers during the last two years. Both top spots (male and female) were taken by Japanese skiers. The winner finished the 45 km run in 2 hours, one minute, just a couple minutes ahead of his compatriot. That afternoon we did have the place to ourselves. The weather was perfect and the track was still fine. We hadn’t done this in awhile, and it felt good. From our window, we could see Mont Blanc to the west. Lillaz is at the end of a valley that runs east-west. 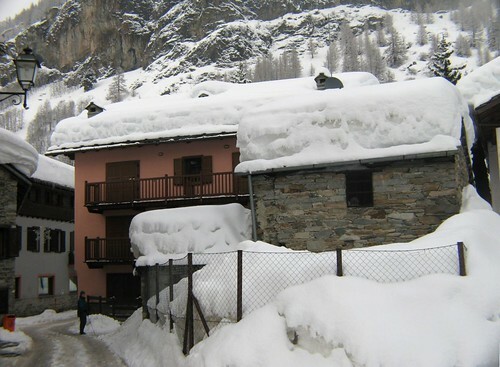 A second valley runs north-south, heading from the village of Cogne towards the mountain of Gran Paradiso.The village at its head is called Valnontey. We headed up there by car on the Monday, stopping for a leisurely lunch in Cogne. It is a spectacular valley If the word awesome hadn’t been stamped into meaningless phonemes over the last decade by almost everyone, it would be the exact word to use to describe the peaks around us. The Alps are awesome. But as we headed out a helicopter flew overhead, its blades making an ominous sound in the quiet afternoon. The temperature had climbed quickly during the day and the amount of snow on the steep rock faces was considerable. 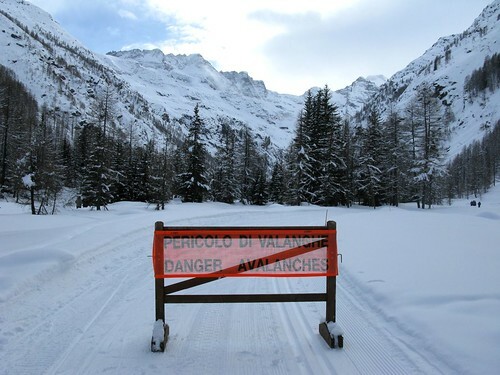 Something had triggered an avalanche. 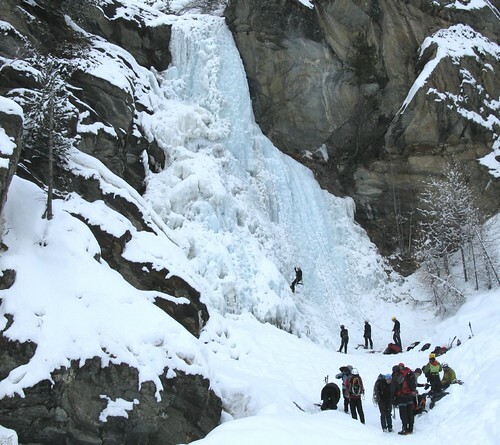 It knocked two climbers off the face of Valmiana, ice climb number 8 of 53 in Valnontey. A 33 year-old Frenchman was dead; his Irish partner survived the fall. It would be ghoulish to say that we enjoyed our afternoon, but we were ignorant of the tragedy until our ski was done. Tomorrow I head home to Melbourne, back to the land where whole towns have been wiped out by flames. I will miss winter. I’ll miss the Italians, my teachers and fellow students at Italiano Porticando. I’ll miss the city, of course, and the spectacular Alps. The snow has melted in Torino. With sunshine and warmer weather it seemed almost like Spring yesterday. It was Valentine’s Day and there were throngs of people taking advantage of artistic events on view throughout the city. I have been struck low with a cold, so my participation was quite by chance and somewhat less than enthusiastic. It was a walk I was after. Despite the disappearance of the snow, il inverno is not over yet. If you were to walk down Corso Re Umberto and look off to the right, your attention would be seized by an image of white-covered mountains that look right there on a clear day. I don’t know what possessed me to ask our banker where to go cross-country skiing, but it was on my mind and he seemed as good a candidate as any. It takes awhile to do most things in Italy, and bank accounts are only marginally less trouble than getting married. Much to my surprise, the young banker was an enthusiast. “Cogne,” he said. He even threw in the name of the hotel where he stayed when he went there. Self-propelled skiers are the poor relatives of the gravity sports crowd, so we were quite impressed with the fifty kilometers of groomed trails in the area. Downhill resorts often provide some sop to cross-country skiers, but ten kilometers seems to be the limit. Cogne was on the northern edge of a huge park called Gran Paradiso, near the French border. With the assistance of a travel agent, I booked a room at the hotel (thanks to a last-minute cancellation) and an economy car for the trip up into the mountains. We could rent skis right at the hotel, so we didn’t have to bother with a rack. It was the driving that worried me. If I had known then what I know now, I wouldn’t have been just worried, I would have been terrified. I must admit, things began badly. To confirm the rental, I checked the number on the rental slip I’d been given by the agent. It was not a local number, so I looked up the car rental place on the internet and called that number. Someone said “fire brigade” in Italian and English and hung up. I tried again. Same response. The third time, a man answered and said “fuoco?” Hung up. The car rental place was a good half hour walk from where we live. I was either calling an incorrect number or they were having a fire at the rental place and someone was good enough to answer the phone while they were trying to put it out. There was only one way to find out. This did not put me in the best of moods, I’m afraid. I did not want to drive back to the flat through the maze of one-way roads in our neighborhood, so we would still have to lug our suitcase to the car rental place. Needless to say, there was no sign of flames. I didn’t even mention my phone call or my misapprehension. I just handed over my International license and my credit card. After some discussion as to whether or not we would need catene (chains), it was decided we’d better have them just in case. We were heading into the Alps, after all, and it could very well snow. The agent suggested that we avoid driving through the city by heading south five or six kilometers, then picking up the Tagenziale, which circles the city. We were actually heading north, to Valle D’Aoasta. We were heading for Mont Blanc. Twenty years ago when I was more fit and more foolish I managed to convince my “partner” that we should fly from New York City to Yellowstone National Park to go winter camping. I had been captivated by an article in “Outside” magazine. The author had managed to find a hot spring in the Park that had just the right amount of run off to turn a geothermal pool into a perfect, core-heated hot tub. It looked positively idyllic. I did not know that ignorant adventurers often turn themselves into lobsters in such pools. I had a pair of wide, wooden Nordic skis. She had nothing comparable so we went shopping in New York City. Surprisingly, we managed to track down a pair of wide fiberglass skis. I crammed all our gear into backpacks and we headed off to Montana. We had booked the snow cat to get us into the Old Faithful Lodge, which stays open for snowmobilers and the handful of winter visitors who come in the cat. It was a long, slow ride in to the Lodge. We were planning on staying one night and skiing to the campsite the next day. Then an arctic front came in like a hurricane. The temperature dropped 60 degrees Fahrenheit in one day (Celsius -1 to -34.) and the Governor declared a state of emergency. When we approached the Ranger for our permit he told us (politely) that we were out of our minds. He wouldn’t consider it. So we caught a ride with the cat and went out for a day ski. The snow was so cold that the crystals stayed sharp as shards of glass. 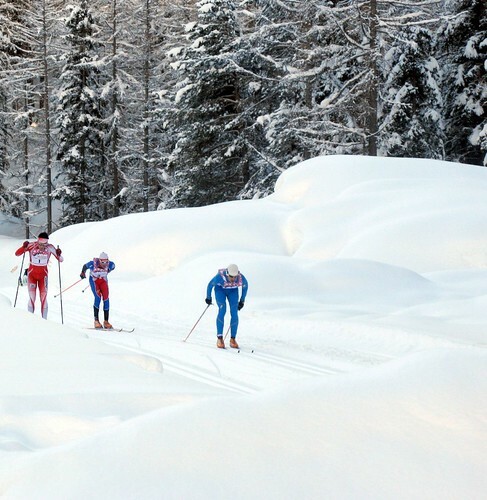 The glide part of cross country skiing works because the friction of the ski melts a layer of snow beneath the ski. This was like slogging through sand on long boards. My wooden skis moved, at least. The brand new fiberglass skis were useless. When I suggested to my partner, (tactfully, I thought) that she might want to put in a little more effort so that we would get back before dark, she took off her skis and through them at me. I may be an idiot but I can take a hint. I strapped them on and tried to glide. It was like being on fly paper. She glided away and left me to stew about faulty assumptions. I finally gave up trying to wax my way out of the problem and and simply walked on the snow, using the skis as cumbersome snowshoes. Halfway back we came across a herd of buffalo. They stopped and lowered their massive heads, steam coming out of their nostrils. We stared. They stared. Nobody moved. Then we made a wide detour out into the untracked snow. This land was their land, after all. Quebecers have a famous anthem that goes this way– Mon pays, ce n’est pas un pays, c’est l’hiver. My country is not a country; it is winter. In places where it snows, the world is transformed. Every hill and stream becomes a sculpture, a new form. Out in the winter, you become new as well. Here in Australia, you have to get into the mountains to experience it, and it is magical. We marveled with Jason as he caught a snowflake in his mitten and watched it melt, surprisingly slowly. We soaked up stories about Erich’s “Evel Knievel” adventures. We enjoyed the silent company of snow gums. We took simple pleasure in the elemental processes that winter camping requires: staying warm, cutting firewood, fetching water, cooking food, sleeping in tents, exploring a thousand avenues of conversation, drinking schnapps and brandy, and eating, well, everything. There was the soft snow. There were a million stars in the southern sky. There were warm sleeping bags at the end of the day. What more could you ask for? You might think that a seven-hour drive and three hour ski in gale-force winds would go a long way toward ensuring that our home away from home was less than crowded. That we would, in effect, have the place pretty much to ourselves. Such was not the case. We weren’t even the first to arrive for the long weekend. Three other snow campers caught up with us at the dam and made it to the hut before we arrived. Then there was Basil, a dusky antechinus. He/She seemed to be a regular at Edmondson’s hut and was entirely blase about human intruders. 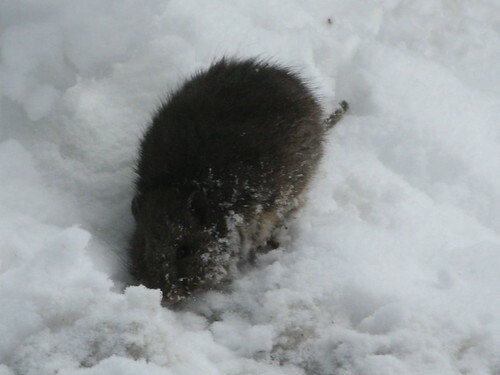 We heard the next morning that that Basil had curled up inside the hearth of the fireplace with a fire going. It sounded almost suicidal, but none of us was an expert. According to Wikepedia, the Dusky Antechinus is active at many times of the day. It mostly eats invertebrates, although it will occasionally devour small lizards and skinks. It has a short and vigorous mating season (which occurs during winter), after which all of the males die. If Basil was male, then his days were numbered and he should definitely be out enjoying himself. We were six when we started out, but Frank was already crook (sick) with a bad cold. He and his son spent much of Saturday in the tent. Unfortunately, the cold went from bad to worse. They finally packed it on on Sunday morning and skied out. It never seemed hectic during our winter sojourn, but we were inundated with visitors. Forty people or more came through there in the five days of our getaway. 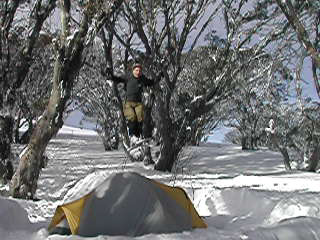 It was an easy ski from Falls Creek; it had a hut with a fireplace, a drop toilet and water from a creek. By winter camping standards, it was positively luxurious. He humored me. The training was not specifically about waging war in the snow, he said. It was about testing oneself in a challenging situation.These were all officers, volunteers who would take this training back to their day jobs. They would gain confidence and train others. He let us in one deep, dark secret. Their final night was going to be spent in snow caves without sleeping bags. I didn’t want to be around in the morning. Especially if they had guns. Alan had offered me a place in his tent. He had no idea how generous that was. I didn’t sleep a wink the first night because of the incredible wind. While he had a steel bladder, I had to get up in the middle of the night, not once, but twice. I had to turn on my torch (flash light) and crawl over him to emerge on the leeward side of the tent. We swapped places the next day and I got much better at my midnight exits, which were mercifully brief. When I did manage to get to sleep, I have no doubt that I snored. Loudly. Someday, it will all be forgiven. And perhaps we’ll do it again. We’re such slow learners, humans. But then, we have much more time than Basil and we have the long days of summer to forget. There are a number of reasons why I was not looking forward to the outbound trek. My cycling and exercise routine had fallen by the wayside during our recent sojourn in North America. I had not shouldered a backpack in years or been on cross-country skis in a decade. My gear consisted of rented boots and borrowed skis, downhill skis that had been modified for back country touring. I regarded my companions as mountain men. They had all done this before. The group had come together over the years through work connections. I was the only one who was not working or going to school. We were a demographic oddity, covering a considerable age–span sixties, fifties, forties, thirties, and fifteen. We were heading into the great white unknown in gale-force winds. All I knew was that it was roughly 8 kilometers (5 miles) distant and that the climb was not significant. What Alan neglected to tell me was that the 8 kms were “as the crow flies.” That afternoon a crow would have had a hard time going anywhere. The Great Dividing Range was the first major, physical obstacle that the early English settlers had to surmount to open up the interior. The name describes a complex of mountain ranges, plateaus, upland areas and escarpments with an ancient geological history. stretching 3500 kms (2200 miles) from Queensland down to Victoria. It is called the East Australian Cordillera. I read somewhere that the first domesticated creatures to find their way through were a herd of cows that wandered away from Sydney. Our first major obstacle was the “damn” dam, a long concrete barrier called Rocky Valley Storage. Its location and shape generate fierce winds. It was on the other side of the dam, at the junction of two different routes to our destination. that I put my foot wrong. We had re-assembled on the far side of the dam. Alan suggested that I lead off on the more protected route, not realizing that I couldn’t see where I was going. I had equipped myself with old, downhill ski goggles, glacier glasses, and prescription glasses that were self-tinting. Absolutely nothing worked. I was, in effect, snow blind. So, I followed my instincts and floundered into the creek. The Alpine area of Victoria has been explored and exploited over the years by a number of diverse users, from gold prospectors to cattle men, loggers to engineers in search of “white gold,” hydroelectric power. The cattlemen built the huts and pioneered many of the routes used by bushwalkers today. Grazing rights were still in existence until 2005. Hydroelectric power created the possibility of downhill skiing. The first chair-lift in Oz was built here in 1957. The village now has accommodation for 4500, restaurants and bars. As I awkwardly extricated myself from the creek, it dawned on me that one of those rooms in Falls Creek might have my name on it. We had not come far. I could bow out with a good excuse, head back down the trail to the village, have a good meal, spend four nights in comfort instead of the cold snow. But my socks were not soaked. When would I get another chance to do this? I made up my mind to carry on. It was only a matter of putting one foot in front of the other, after all, for as long as it took to get there. The rest of my companions went ahead of me and I followed. Sometimes I had to stop and recover my energy, but no one was moving at light speed. When we bent into the wind and I felt the blasts of sharp snow stinging my face, the only consolation was that were were closing in on Edmonsons Hut, our destination.There was a large stand of snowgums, the hardy eucalypts that shed snow by bending their branches almost to the ground. There was shelter. We were home. Our destination for the winter camping trip was a place called Falls Creek, some 400 kilometers (250 miles) to the northeast, on the way to Sydney. A good part of the travel there is on the Hume Highway, one of the most heavily trafficked stretches of bitumen (asphalt) in all of Australia. That part is fast. The last section, when you head toward the Alpine region, makes up for it. It is a slow, two-lane road, threading its way through farm country, gradually climbing into the Alpine National Park. Our foray into the snow began long before we set out. For me it started on June 24 with a casual email from Alan, my cycling friend, alerting me to the fact that a winter adventure was in the works. It would likely happen the second week of August. Would I like to come? Like a small snowball accumulating size and speed on its way downhill, a flurry of emails followed over the next five weeks, some were about dates and details, others were simply banter among the various members of the group. When it all shook out, there were six people going for five days the first week of August. It was all still weather dependent, of course. Rain can ruin the best-laid plans of ski trips, and winter weather here. like all Victorian weather, is anything but consistent. The last weather prediction we received before heading out had good news and bad. The good news was that new snow was predicted. The not-so-good news was that it would probably be accompanied by gale-force winds. It didn’t occur to me that gale-force winds driving pellets of snow can feel like a shotgun blast. The plan was to rise very, very early on Friday morning, meet at a designated carpool spot, then head out for the long drive in order to be at the campsite by early afternoon. I suspect I was not the only one who spent a restless night waiting for the alarm clock to bounce me out of bed at 3:30 am. We were on the road by 5:15, rolling into a McDonald’s just before our exit off the Hume Highway by 8:30. It was packed. With the exception of some of the automobiles, an industrial-strength, Italian espresso machine and odd items on the menu, it could have been snow country, USA. There were skis and snowboards, parkas and boots. Heavy sweaters and hardy looking folks wolfing down bacon and egg sandwiches with a curious breakfast condiment, barbecue sauce. 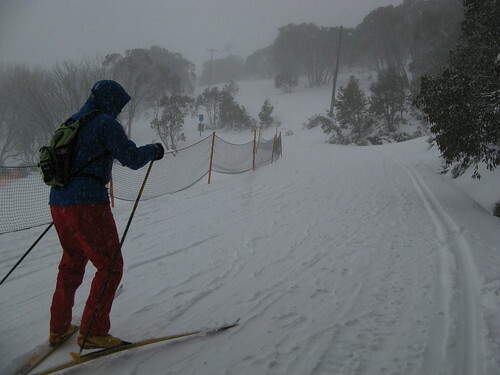 On the last Saturday in August, Falls Creek hosts the Kangaroo Hoppet, a 42 km cross country race that counts as a main race with the Worldloppet ski Federation. Over the years, the event has been dominated by Australian racers, but last year’s male winner came from Germany. We nosed our way to a likely spot in the huge parking lot, unloaded the Subaru, and headed off. The wind was whipping up. One of our members was already nursing a cold that would end up ruining the trip for him and his son. There were at least ten kilometers to go with 20 kilo (44 pound) packs on our backs and it was not going to get any warmer. Little did I know I would soon be plunging into an icy stream. Stay tuned for the misery.